It's summer, which means my house gets humid! Pair that with the comings and goings of 4 active little boys, and - even when I've cleaned all day - my house can get a musty smell to it. I've always used air fresheners in the past, but I detest those that have a "fake" smell. I tried out the new AirWick National Parks limited edition line as part of a campaign with Mom Central, and I can't believe that I actually really liked 2 of the scents. 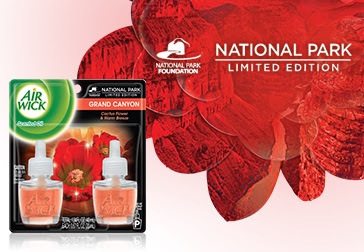 The National Parks limited edition collection was crafted by fragrance experts who spend countless hours creating the perfect harmony of fragrance notes representative of the natural elements found in these national parks and pays homage to the brand’s “The Craft of Fragrance” creative platform. Now, I can't say that I've been to a National Park; we visit State Parks all the time. None of them probably smell as pleasant as these products, but I can see how the products were inspired by the parks. I have always been a candle fan, so I had no problems with the fragrance of the Denali. It had tones of sweet cotton grass and spring air, so it was like many of the "fresh laundry" scented candles I've tried, but with less harshness. It lasted 25 hours and came in a pretty frosted glass container, so no one knew that it was a "freshener" product. I also tried the Scented Oils and was particularly fond of the American Samoa fragrance. It was fruity and had a hint of coconut, but was not overpowering with it's "sweetness." I also like that the oil warmer could be adjusted to just let out a little fragrance at a time; I think this helps keep a more natural smell in my home. When cleaning your house just isn't enough, I think it's OK to "cheat" a bit with a fragrance product. The more subtle and natural -- the better; which is why these National Park inspired products really do fit in!